JNN 04 Jan 2015 Manama : “The West believes in the protection of human rights and democracy, but when it comes to the regimes in the region, such values are ignored and not discussed at a greater level because of these interests they have in the Persian Gulf,” Sheikh Salman told Press in an interview just before his arrest on December 28. 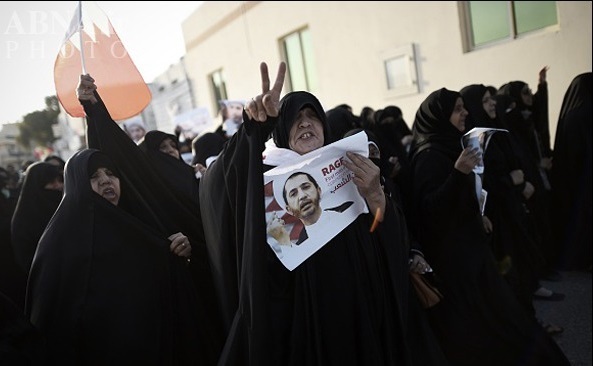 The top al-Wefaq figure further emphasized the role of some regional Arab countries in the Al Khalifa regime’s heavy-handed crackdown on popular anti-government protests across the Persian Gulf state. “It is not a secret that some countries have sent military troops into Bahrain like Saudi Arabia and the UAE (United Arab Emirates),” he said, adding that “there is a huge budget given to Bahrain in economic aid through Marshall fund program” by the [Persian] Gulf Cooperation Council ([P]GCC). New nationwide rallies have erupted in Bahrain since the Manama regime arrested Salman on December 28 days after the 49-year-old respected cleric secured a new four-year term in al-Wefaq’s general congress. The Bahraini regime’s continued crackdown on dissident voices has drawn condemnation from several human rights groups. Iran, the United Nations, the US and the EU have all called on Manama to free Salman. Iranian Foreign Minister Mohammad Javad Zarif called on Wednesday for the immediate freedom of prominent Bahraini opposition leader Sheikh Ali Salman, held by the ruling regime. “Coercive attitudes towards the respected leaders, who have not deviated from peaceful approaches to pursue public demands despite the tough political and security conditions in recent years, will complicate the situation and increase the threats,” Zarif said on Wednesday. Sheikh Salman’s lawyer has asserted that his client is charged with “provoking hatred for the ruling regime and attending illegal demonstrations”. Following the massive anti-regime protests held on Friday, Bahrain’s Interior Ministry had ordered Salman to appear before police investigators on Sunday without providing any explanation as to why the summons was issued. Bahrain opposition leader Sheikh Ali Salman was remanded in custody on December 23 on charges including seeking regime change, prompting his group to decry tyrannical rule in the region. This entry was posted in Jafria and tagged Bahrain, Persian Gulf, Sheikh Ali Salman, Sheikh Salman. Bookmark the permalink.